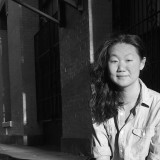 Wendy Xu is the author of You Are Not Dead (Cleveland State University Poetry Center, 2013) and Naturalism (Brooklyn Arts Press, 2015). Her writing has appeared in The Best American Poetry, Boston Review, Poetry, Gulf Coast, and elsewhere–in 2014 she was awarded a Ruth Lilly Fellowship from the Poetry Foundation. Born in Shandong, China, in 1987, she currently lives and teaches in New York City.